The M3 is BMW’s high-performance answer to the 3 Series, built by their in-house motorsport division, BMW M GmbH. The first iteration of the model was launched in 1985 and the line is still going strong today. Outwardly, an understated road-going vehicle but truly a wolf in sheep’s clothing, the M3 was designed to combine practicality whilst still being able to deliver a genuinely entertaining drive. 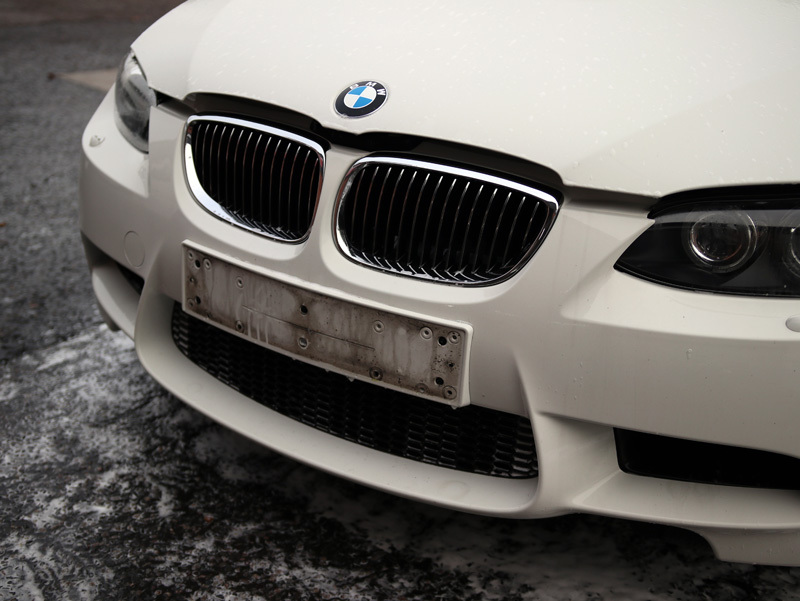 Between 2007 and 2011, BMW produced the E90 series; the E90 saloon, the E93 convertible and the most popular, the E92 coupe. 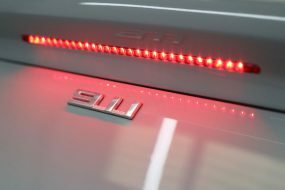 The E90 series featured BMW’s most advanced engine management computer to that point. 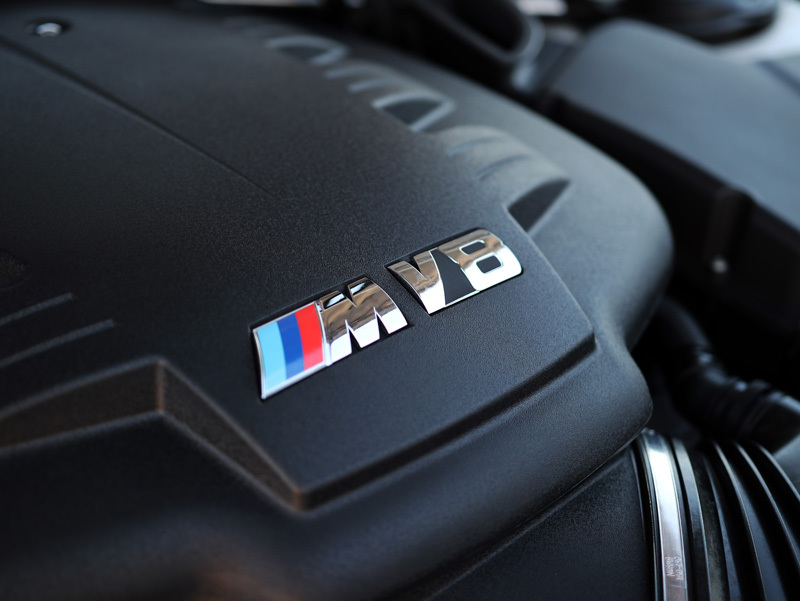 The previous incarnation of the M3 had used a straight six engine, the E90 used a naturally aspirated V8, yet the new system still claimed to be more fuel efficient over the one it replaced. 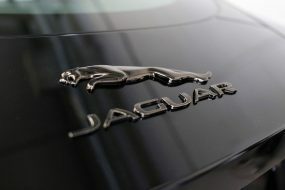 Additionally, the new engine was 15kg lighter. Displacing 3999cc, the V8 produces 414bhp at 8300rpm and 295lb ft of torque at 3900rpm. This produces 0-60mph in 4.7 seconds for the manual version and 4.5 seconds if the car uses a M-DCT (Double-Clutch Transmission) gearbox. Put into comparative terms, it’s quicker than a Porsche 997 Carrera S in a straight line. Cleverly, the rev counter incorporates graduated amber and red sections to indicate when the oil is warm – handy for those keen to get heavy on the right pedal without causing excessive engine wear. One of the biggest draws for the M3 is the combination of fun and practicality. Poodling up the motorway, the M3 provides a comfortable and not too juicy ride. However, on a track, press the ‘M Dynamic’ button and the magic happens: sharper steering, sharper body control, sharper throttle response – suddenly, the M3 earns its stripes. And being naturally aspirated, it doesn’t suffer from the spikes of oversteer the turbocharged incarnations suffered from. 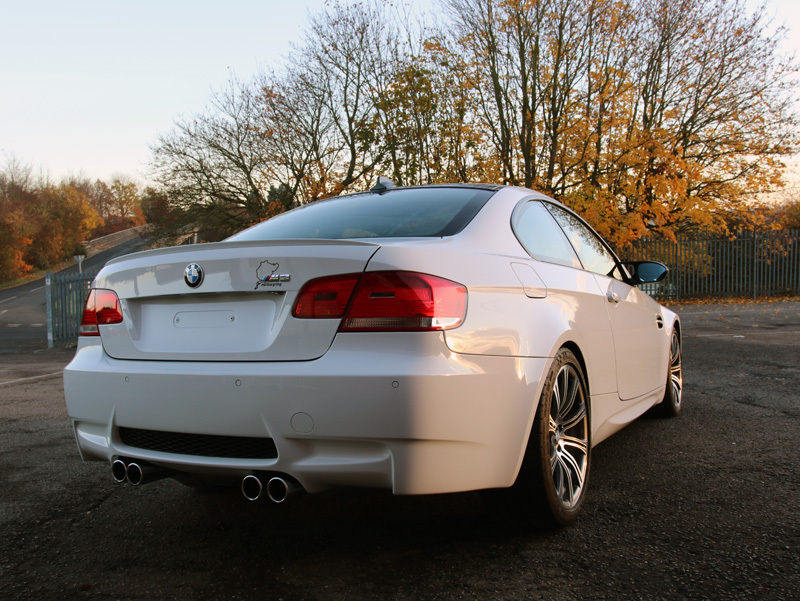 The owner of this Alpina White M3 had purchased it second hand as a great low mileage example. 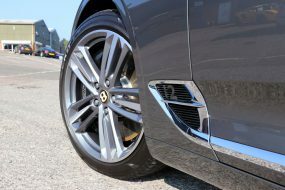 A regular visitor to the Nurburgring, he also owns a Porsche 996 GT3 which had previously been worked on at UF’s Brands Hatch based Detailing Studio. Impressed with the results, he returned with his latest purchase and requested a Gloss Enhancement Treatment with an upgrade to the ‘Gold’ service. 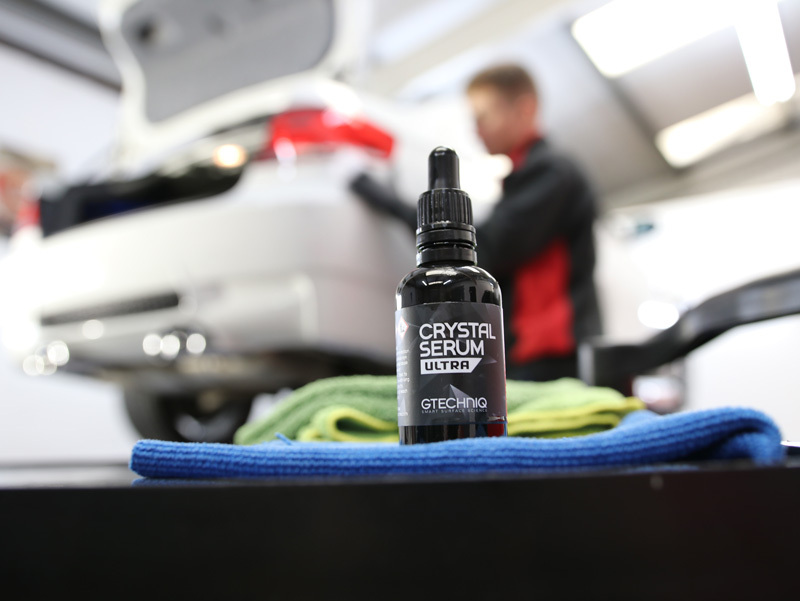 For this, UF is now pleased to be able to offer Crystal Serum Ultra (CS Ultra), the new nanotechnology-based professional-only, ceramic coating from British manufacturer, Gtechniq. 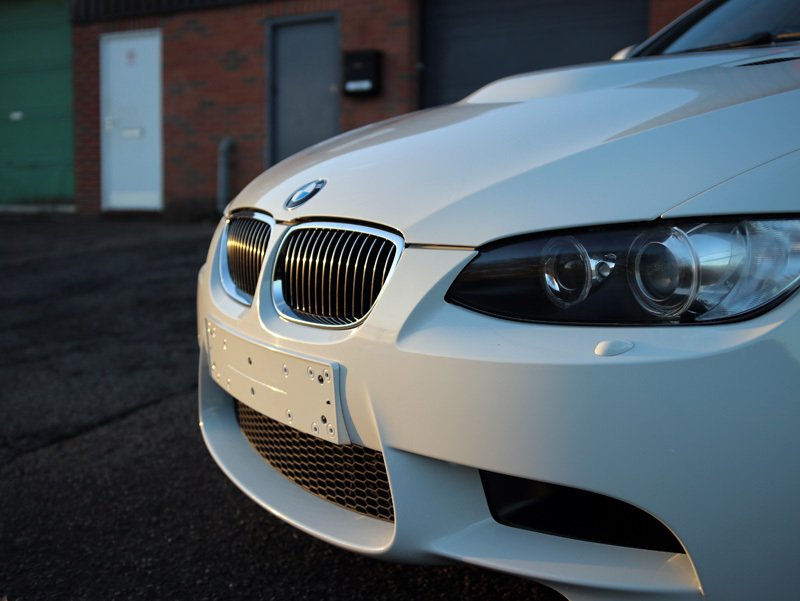 Before the protection could be applied, it was first necessary to ensure the M3 was thoroughly decontaminated and then machine polished. First, the number plates were removed to allow the area behind to be completely cleaned. The bodywork and wheels were sprayed with Gtechniq W6 Iron & General Fallout Remover. This is a non-contact method of removing ferrous contamination caused by brake pads shredding when the brakes are applied. W6 contains an active ingredient with a colour-change function. On contact with iron particles, the ingredient begins to change colour to deep purple. W6 reacts chemically with the particles, causing them to shrink and forcing the bond between particle and substrate to break. These particles can then easily be rinsed away. 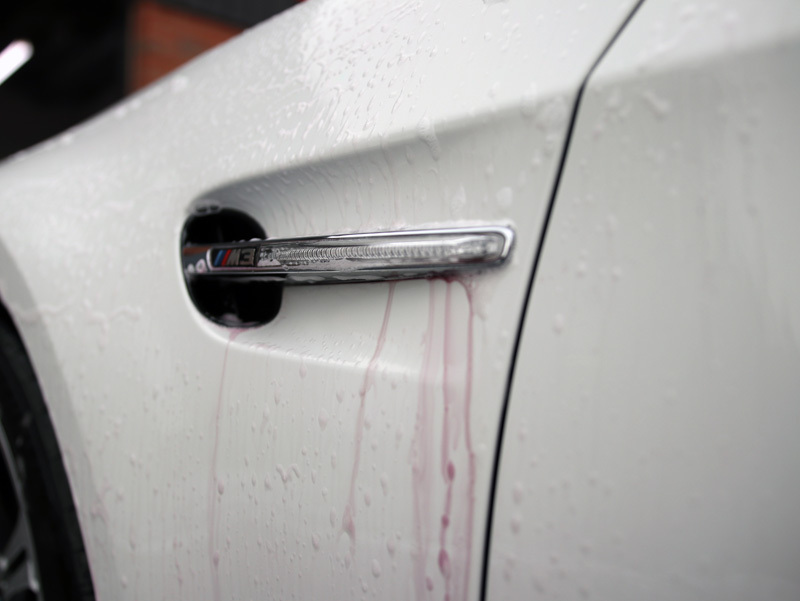 On the Alpina White paintwork, the colour change was highly visible. Gtechniq W5 Citrus All Purpose Cleaner was applied over the bodywork, to the wheels and under the wheel arches. 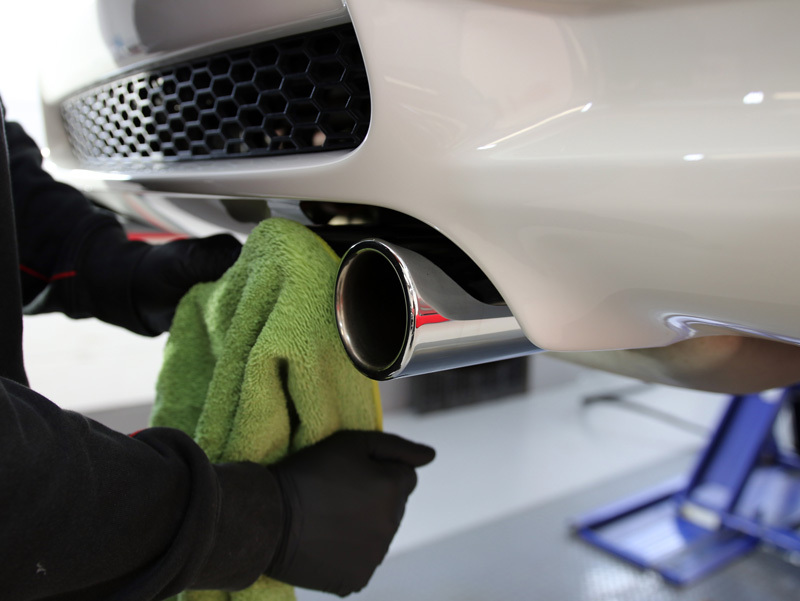 Acting as a degreaser, W5 breaks down oily residues and diesel splatters which otherwise may linger on the substrates, potentially causing staining and interfering with the bonding of the coating. A clay mitt was used to ensure any residual iron, tar or tree sap were eliminated from the bodywork. The M3 was then rinsed thoroughly using a Kranzle K-1152 TST pressure washer. 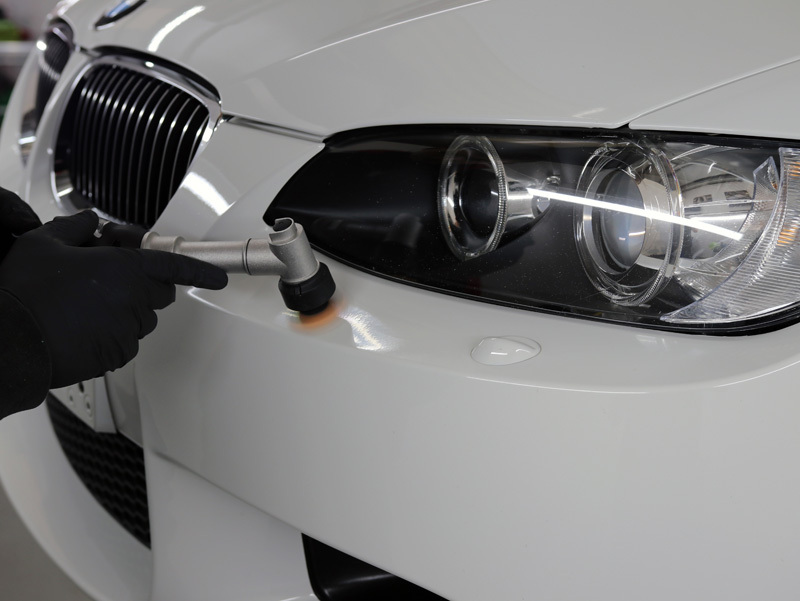 The M3 was then pre-cleaned using Ultimate Snow Foam applied through a foam lance attached to the Kranzle pressure washer. The combination of the product’s formulation and the pressure created by the K-1152 TST provides a thick lather that clings even to vertical surfaces, lifting larger particles of dirt and grit away and encapsulating them within the foam. This allows them to be rinsed away easily without scratching the paintwork. Finally, the M3 was washed using the Two Bucket Method. This keeps wash water and rinse water separately, so that the wash mitt, dirty from having cleaned a section of the car, can be rinsed in clean water, brushed across the Grit Guard in the bottom of the bucket, leaving the contamination in the Rinse Bucket. Once clean, the mitt is reloaded with the soapy solution from the Wash Bucket. The water in the Wash Bucket remains clean while the water in the Rinse Bucket contains the dirt. This helps prevent swirls and scratches being put into the clear coat during the wash process. After being rinsed clear of suds, the M3 was given a pure water final rinse using an Aqua Gleam De-ionising Water Filter attached in-line with the water supply. The car was then brought into the detailing studio and dried using a BigBoi BlowR Pro touchless dryer. This high powered unit forces water off panels and trapped droplets out of tight areas. The twin motors are so effective, the BlowR Pro dries vehicles up to 80 times faster than conventional drying methods. 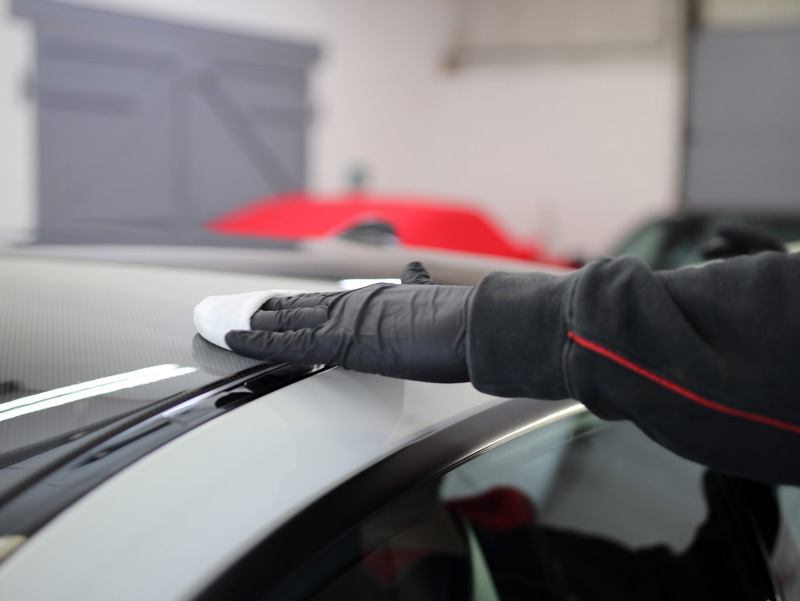 As a non-contact method of drying, it also eliminates a further stage where scratches and swirls might be introduced to paintwork. Prior to commencing the machine polishing stages, multiple paint depth readings were taken on each panel to check the uniformity of the levels. The panels were inspected under high-intensity lighting to check for areas of damage. Swirls and a few random deep scratches (RDS) were present and these were noted on the Vehicle Appraisal Sheet for reference during machine polishing. German paintwork is typically quite hard and the M3 was no exception. 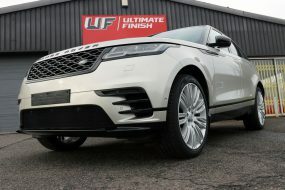 To eliminate the blemishes, a RUPES LHR 15ES dual action polisher was used with a RUPES Green Medium Polishing Pad and Koch-Chemie Heavy Cut H8.02. 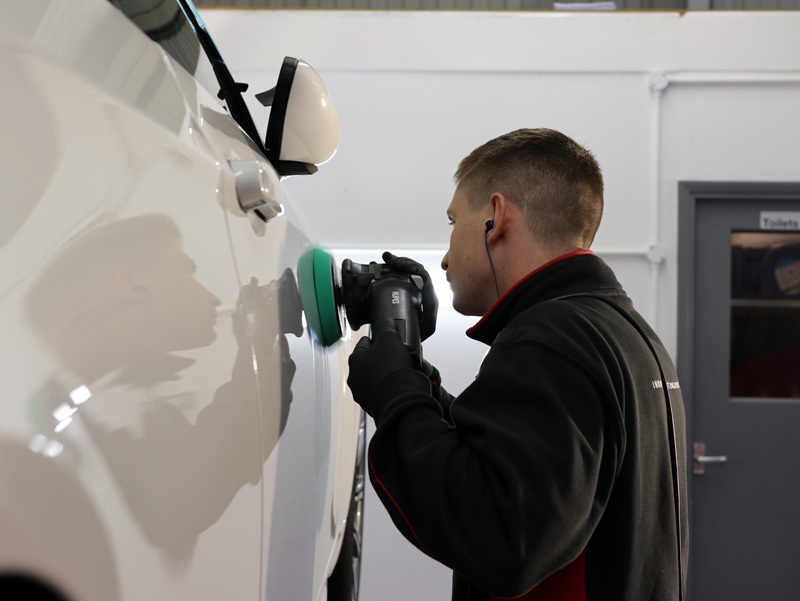 For narrow areas, a RUPES BigFoot Nano iBrid was used. This handy tool can be used in either rotary mode or dual action and can be operated connected to mains power or, if necessary, battery power. The small head allows machine polishing in tight areas. On the M3, this was particularly useful for the edges surrounding the headlamps, where the washer jets made accessing with a larger polisher impossible. 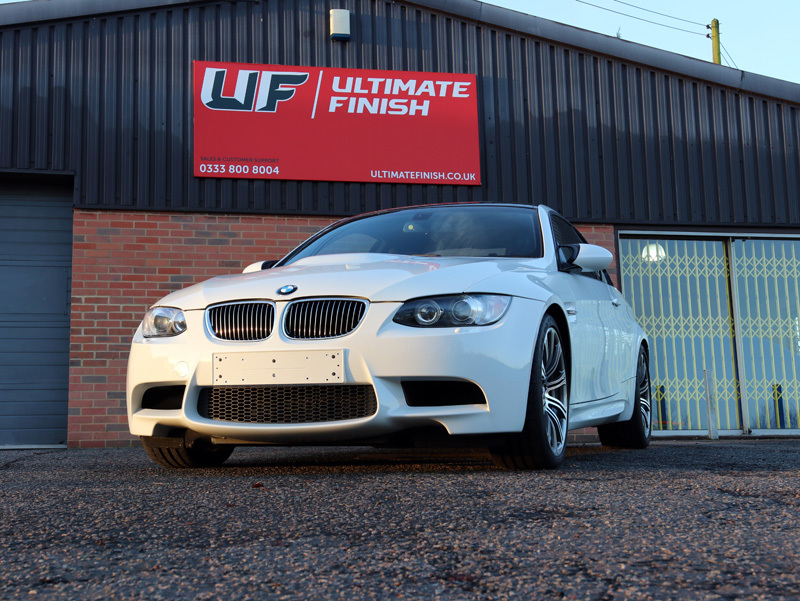 Refining of the paintwork was completed using a 3M PERFECT-IT III Black Polishing Pad and Menzerna Super Finish Plus 3800, bringing the Alpina White up to a high gloss. 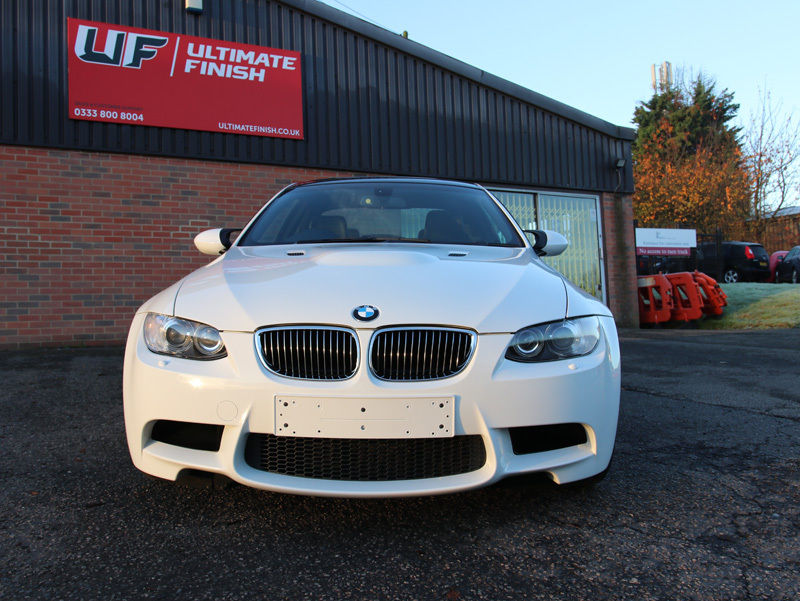 The M3 was then wiped over with Gtechniq Panel Wipe to remove any polish residues, preparing it for the coating. CS Ultra features increased resistance to wash-induced swirls, curing to 10H on the scale of hardness. This is harder than the standard version of Crystal Serum, which cures to 9H. 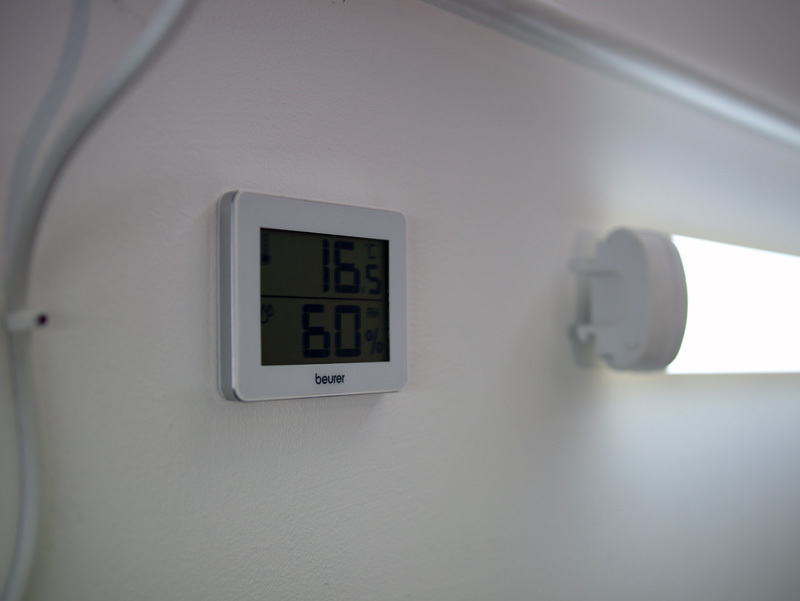 As with the original, CS Ultra must be applied in tightly controlled environmental conditions, with temperature and humidity levels within set parameters which must be maintained during the curing process. Correctly applied, CS Ultra delivers an unbeatable shine and is virtually impervious to extremes of pH, so will not be affected by strong wash chemicals or industrial fallout. 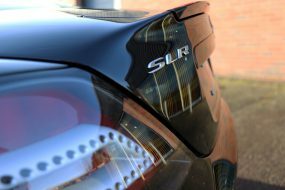 Treated surfaces become super slick to the touch, so water, oils and dirt are repelled helping the vehicle stay cleaner for longer and making the weekly wash process easier and safer. 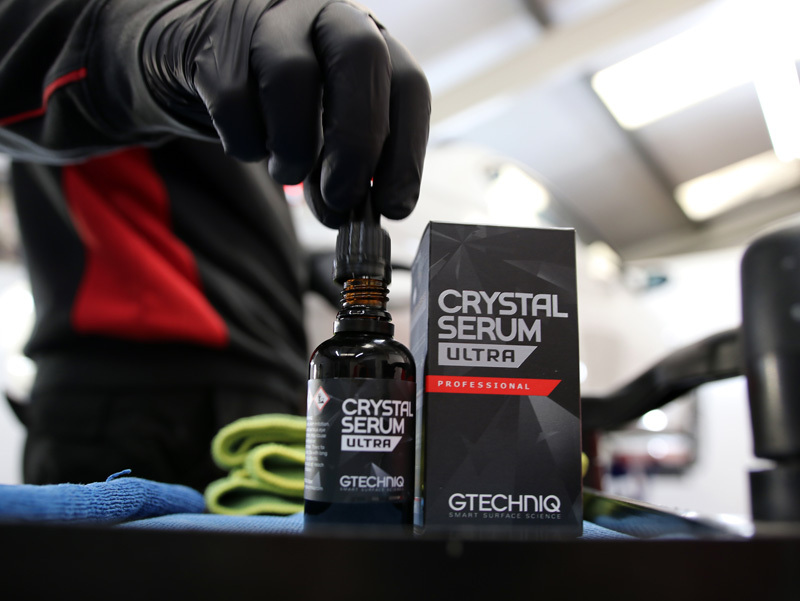 Gtechniq is so confident in the performance of CS Ultra, it carries a nine-year manufacturer’s guarantee. For these reasons, CS Ultra is available as a service only through Gtechniq-approved detailing studios. CS Ultra can also be used to protect polycarbonates, so a layer was used to protect the headlight and tail light covers. 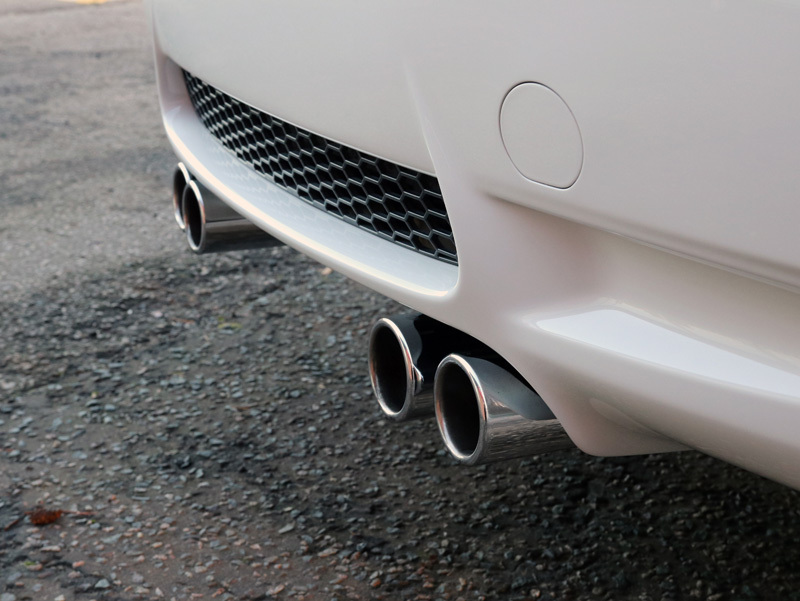 Whilst CS Ultra was curing, the quad exhaust tips were polished using Gtechniq M1 All Metal Polish. Rather than using abrasive particles as many metal polishes do, M1 uses chemical cleaners to remove tarnish and burnish the metalwork to a highly reflective lustre. 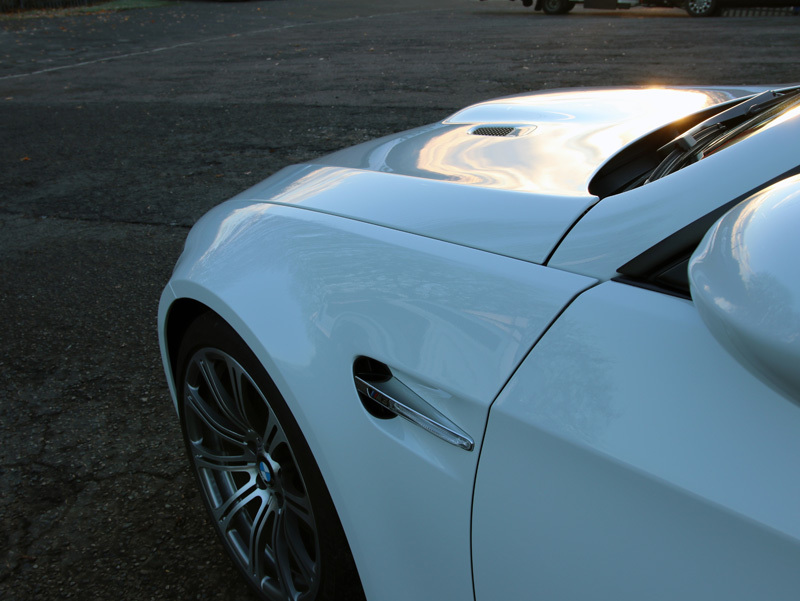 The M3’s Alpina White paintwork looked absolutely glacial in the early morning sunshine and now freshly coated with the pinnacle of automotive protection it is sure to stay that way for many years to come.